If you totally adore the polka-dotted frenzy that permeates the art of Yayoi Kusama, you'll be glad to know you can continue your enjoyment of her art in this specially themed afternoon tea at The Courtyard, Fullerton Hotel. The tea is only here for a month - from 9 June to 10 July 2017. The Fullerton Hotel Singapore’s Executive Pastry Chef, Enrico Pezzelato, who is a fan of Kusama, has specially designed five sweet creations will draw from the iconic Japanese artist’s original pieces currently exhibiting at National Gallery Singapore, from 9 June to 3 September. Afternoon #tea with a touch of Yayoi Kusama at The Courtyard @fullertonhotel - love the #desserts themed after the #quirky artist's works! S$43 per pax daily from 9 June to 10 July. Have you gone to see #YayoiKusama in #Singapore yet? These designs are personally approved by Kusama's agency in Japan. These include a cube of lychee mousse flecked with dots, which mirror the constellation in Gleaming Lights of the Souls. I liked this one; it had a piece of kueh lapis as the base for the mousse. It's a nice touch using a local element. The most colourful treat is crafted with hazelnut cream on a Breton sable that carries bright gelatinous dots, a tribute to All My Love for the Tulips, I Pray Forever, a piece that was sold for US$5.1 million – the highest price ever paid for a work made by a female artist. The big dots will remind you of colourfully decorated cream cakes in retro bakeries. A cottony soft strawberry shortcake, topped with whipping cream and sandwiched between cocoa butter printed with striations, bear the mark of Life is the Heart of a Rainbow. In keeping with Kusama’s I Want to Live Forever from the My Eternal Soul series, 70% Valrhona dark chocolate mousse is tinged a desert red, and topped with a blue chocolate disc and a thin strip of coverture to finish. So rich and delicious the dark chocolate! Also available is a mango cremeux confection, which sits delicately on piped buttercream frosting and a chocolate base, featuring polka dots synonymous with Kusama. This reminds me of Kusama's Pumpkin, one of my favourite pieces. 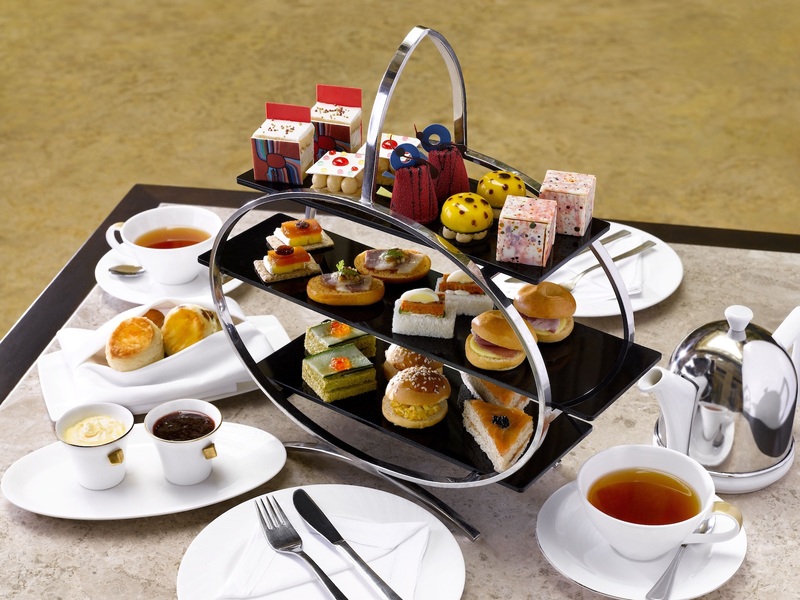 This three-tier Afternoon Tea also comes with finger sandwiches, bite-sized pastries, assorted cakes and freshly baked scones. The latter are served with clotted cream and berry preserves. All items are replenishable and the spread is complemented by free-flowing TWG tea or any coffee of your choice. On Fridays, Saturdays and Sundays, the experience is complemented by a live harpist. The Yayoi Kusama-inspired Afternoon Tea, priced at S$43++ per person, takes place from 9 June to 10 July 2017, from 3.00 p.m. to 6.00 p.m. on Monday to Friday; and 2.00 p.m. to 4.00 p.m. (1st seating), and 4.30 p.m. and 6.00 p.m. (2nd seating) on Saturday and Sunday. Many thanks to The Fullerton Hotel Singapore for the invitation. Last photo courtesy of Fullerton Hotel.